How this social and beauty entrepreneur took charity to the next level. VIOLET GREY profiles female beauty entrepreneurs who are considered industry game changers because of their individual approach to business. Each one entered the conversation in her own manner and maintained a steady, if not unparalleled, trajectory with her indomitable spirit. 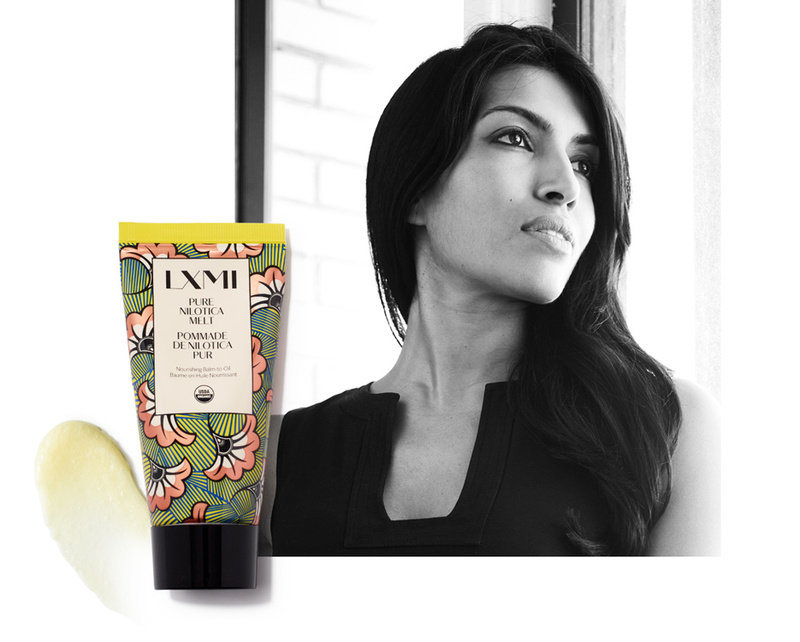 Here, we talk to LXMI founder Leila Janah. Give work. It’s a term LXMI founder Leila Janah lives and breathes. She even wrote a book of the same name, which outlines the essence behind the meaningful phrase—one who literally gives work to men and women who live in poverty. On one of her many visits to East Africa for Samasource, Janah discovered nilotica, an incredibly hydrating ingredient, at a market in Northern Uganda. Nilotica contains 25 percent more essential fatty acids than traditional shea butter. “It has this amazing buttery texture and feels like a natural version of petroleum jelly, but silkier,” she says. “It’s the extract of a nut that grows wild on trees in Northern Uganda and South Sudan.” After trying the ingredient on her skin, which was extremely dry because of her massive amounts of travel, Janah saw its benefits firsthand. Think: ultra-hydrating, smoothing, and brightening. After doing some research, Janah found that nilotica also follows the give work model. “Nilotica is almost exclusively harvested by women,” she says, adding that the main ingredients in her formulas are fair trade certified. “Not only does it give work to low-income women in this very poor part of the world, but it also promotes conservation by keeping these rare trees alive.” The brand also relies on ethnobotany, which is the study of how indigenous communities have used plants for medicinal and spiritual purposes. It’s pretty minimalist, and I like to keep it free of distractions. I have a salt lamp, a bunch of plants, a humidifier, and some inspiring art. In San Francisco, I renovated a little cottage and I opened up the ceiling and put my bed in this little nook. There’s no bed frame; it’s just a comfy mattress on the floor. It’s right under the ceiling and next to a window that overlooks my garden. What I love most is that I can hear birds and smell the garden from my bed. It’s like a little oasis. Usually pretty early, around 5:30 or 6 a.m. I now get a minimum of seven hours’ sleep every night. I think it’s really important. I used to pride myself on being overdosed on caffeine and not needing sleep, but I think that’s a recipe for a short life. I keep our Pure Nilotica Melt by my bedside and apply it every night before I go to bed on my face, the tips of my hair, my cuticles, and my feet because indoor spaces can be really dry. Also, I have some different essential oils that I like to put in my humidifier. I’m trying not to eat too much in the morning and do intermittent fasting—although I’m usually hungry in the morning if I worked out the night before. I start my day with green tea and organic coffee. I make my own nut milk in a Vitamix with almonds, water, a few dates, and cinnamon. Then I blend that up with my matcha or coffee. If I’m good that day, I will meditate or do yoga for 15 to 20 minutes. I travel a lot, so I’ll often do all of the above in a hotel room. Sometimes I bring a blender, which is a little weird. I try to do it more in the evenings. I’m really into dance and outdoor sports. If I’m in San Francisco, I surf in the morning or I go kitesurfing in the afternoon or early evening. But when I’m in New York, I take a dance class. In the morning I rinse my face with a Clarisonic and water to get rid of any dead skin. I dermaplane, which removes more dead skin and exfoliates. Then I use our Crème du Nil, which is really hydrating, and let that sink in for a minute. I also have to use a body lotion when I get out of the shower because my skin gets really dry. We have a body balm called Body Velour, which is very rich, so I usually put that on in the morning or evening. I apply a light foundation from Tarte and then I use LXMI Goddess Glow on the cheekbones. I try not to do too much with my hair. If I have a meeting that requires me to have my hair done, I use hot rollers. If I don’t, then I let it air-dry. Also, I use a little Nilotica Melt on the ends of my hair to keep it more hydrated. Sadly, right now it’s email. When I’m in the zone, I try to read a book. I’m really into ethnobotany. If I’m not reading that, it’s usually email or Twitter. Because Samasource and LXMI have a lot of activity in Europe and East Africa, I try to catch up on email before 10 a.m. I do my writing sometimes early in the morning, either for my blog or my second book. Usually around 8 a.m. I live really close to my office in both San Francisco and New York.